Russian identification documents will be more like European ID cards. Starting in 2030, the circulation of paper passports will cease in Russia. The state is introducing plastic ID documents in their place, similar to the ID cards carried by citizens of European Union countries. These new documents will begin to be issued en masse in 2016. In addition to the cards, citizens will also be issued digital signatures and pin-codes, in order to access state services in an electronic format. Konstantin Romodanovsky, head of the Federal Migration Service (FMS), explained these new documents to Russian Prime Minister Dmitry Medvedev. According to Romodanovsky, a trial to issue plastic cards with an electronic chip — which will replace internal passports for Russian citizens — will begin in 2015. Internal passports: "Without registration, you’re a nobody"
The card will display the name, date of birth and gender of the holder, along with a photograph. The chip will also contain an individual tax number and an insurance number for an individual personal account. This will list contributions for a worker’s future pension and the digital signature of the holder. The head of the FMS did not rule out the possibility that an individual’s fingerprints might also be accommodated on the new documents. These cards will begin to be issued to Russian citizens in 2016; up until 2025, they will be issued in parallel with valid Russian passports. However, in 2030, circulation of paper passports will cease completely in Russia. 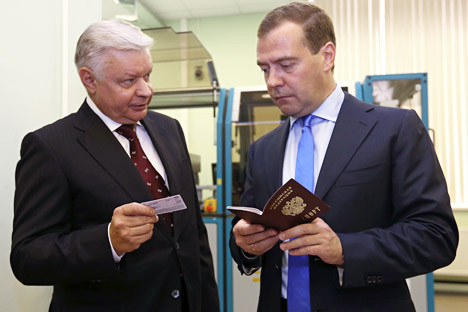 The plastic cards will become “the only ID document for citizens of the Russian Federation,” in the words Romodanovsky. The new documents will be issued at birth, with an expiry date of 10 years; the photograph will only appear once the holder has reached the age of 14. These ID documents will be similar in appearance to those carried by citizens of the European Union. The FMS is planning to roll out this innovation in several pilot regions in 2014. The options being examined are Tatarstan, Yakutiya, Primorye and the Rostov region, as well as Moscow and Podmoskovye. The plastic cards can be obtained in the same way as a conventional passport. According to information from a source, these ID documents will be used as a key to access state services electronically. So far, the FMS has only announced that foreign passports would not be canceled with the introduction of the new plastic cards.